George Dixon became the first black man to win a world boxing title when he captured the bantamweight crown in England and then successfully defended it in America. He later added the world featherweight title, which he held for a total of eight years. Considered to be one of the finest small boxers ever, Dixon was well-respected for both his grace and power. He became interested in fighting while assisting a photographer who took posed boxing pictures. 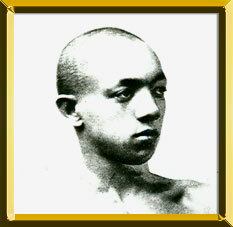 Dixon entered the pro ring in his native Halifax, Nova Scotia in 1886 at the age of sixteen. Under the guidance of manager Tom O'Rourke, Dixon fought Cal McCarthy at the Union Athletic Club in Boston in 1890 for the American version of the featherweight title. Wearing two-ounce gloves, Dixon and McCarthy battled for 70 rounds, only to have the exhausting fight called a draw. That same year Dixon traveled to England to face Nunc Wallace, the holder of the British version of the world bantamweight title. Dixon easily vanquished Wallace, scoring a knockout in the eighteenth round. Dixon returned to America to lay further claim to the title by knocking out bantamweight challenger Johnny Murphy. Dixon also knocked out McCarthy in a rematch in 1891. By 1892, he had outgrown the bantamweight division and began competing solely as a featherweight. With a fourteenth-round knockout of Fred Johnson in Coney Island in 1892, Dixon asserted his claim to the featherweight title. Dixon participated in the three-day Carnival of Champions at the Olympia Club in New Orleans, where most of boxing's top contenders met. Dixon was matched against the amateur champion Jack Skelly, who was white. Dixon controlled the action from the start, broke Skelly's nose, and knocked him out in the eighth. White fans at the match reacted with shock and disgust, and to keep peace, the Olympia Club decided not to conduct any more mixed-race matches. The racist reaction to this fight led to limited black access to other matches, including heavyweight championships. A long string of title defenses was interrupted by only a few quickly-avenged defeats. Terry McGovern finally bested Dixon in 1900 to take the crown away. Dixon lost a non-title rematch with McGovern and never again contended for the title, though he continued to fight until 1906. Dixon died, penniless, three years after retiring.